Located in the east of the UK, Suffolk is home to award-winning beaches, historic market towns, rolling countryside and wildlife-filled woodland. Just two hours drive from London, it's the ideal place to enjoy a relaxing weekend break, an action packed family holiday or a memory-making day out. 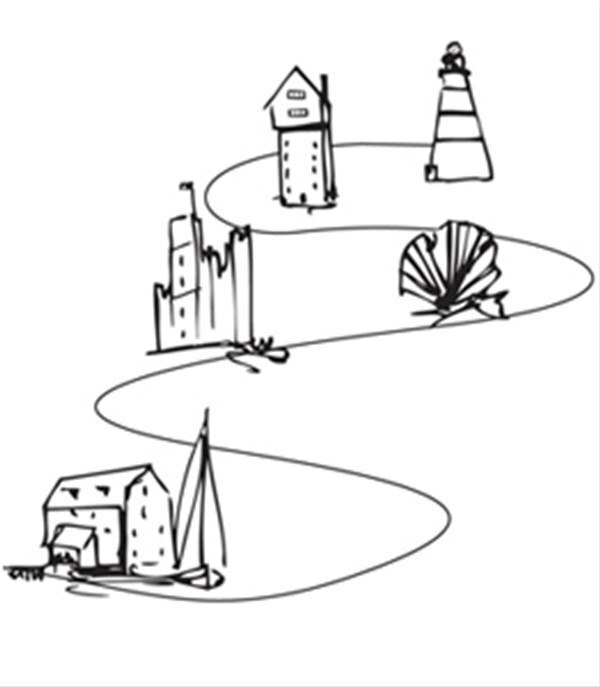 You are in the right place for all the information you need about the Suffolk Coast & the beautiful Waveney Valley but there are some other really useful websites to help you plan trips to other parts of the county, why not have a look! 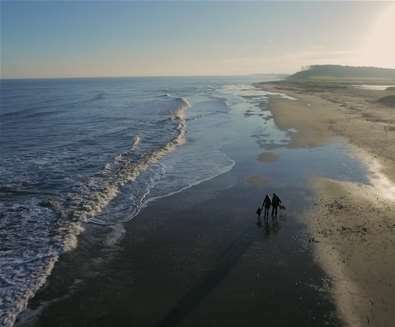 As an area of outstanding natural beauty, award-winning beaches and the gateway to the Broads National Park, The Suffolk Coast is the ideal place to spend a relaxing weekend, romantic getaway, family holiday or outdoor adventure. As the nearest coast to London, The Suffolk Coast is within easy reach of East Anglia’s towns and cities including Norwich, Chelmsford, Colchester and Cambridge; ideal for day trips, weekend breaks and holidays. If quirky shops, cafés and boutiques are what you desire, head to one of the market towns such as Beccles, Bungay, Framlingham or Woodbridge, where you will be spoilt for choice when it comes to independent shopping. You can also stock up on the best of Suffolk’s produce in one of the many delis and farmshops. Family holiday destinations are a’plenty, with Aldeburgh, Southwold, Lowestoft and Felixstowe offering a host of self-catering accommodation, bed and breakfasts and hotels, plus a wide range of fun days out. Visit the ancient burial grounds of Saxon Kings at National Trust Sutton Hoo, discover Suffolk military history at Landguard Fort and visit one of the UKs only working water mills at Woodbridge Tide Mill. Alternatively, take a trip to the African savannah with a day at Africa Alive or experience the thrills of the region’s number 1 theme park, Pleasurewood Hills in Lowestoft. A playground for walkers, cyclists and nature lovers; The Suffolk Coast is home to RSPB Minsmere and RSPB Havergate Island, as well as national trust Dunwich Heath, Rendlesham Forest, not forgetting the stunning coastline and waterways of Orford, Oulton Broad and the River Orwell. 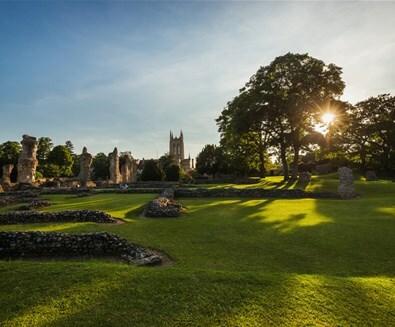 Surrounded by stunning countryside with 1,000 years of history to explore, Bury St Edmunds offers visitors a shopper’s paradise, award-winning restaurants, fantastic annual festivals, historic markets and beautiful open spaces to truly unwind. With the beautiful medieval wool towns of Lavenham, Long Melford and Clare on our doorstep and Cambridge just 30 minutes away, Bury St Edmunds is a jewel in the crown of Suffolk and the perfect indulgence getaway. Not forgetting the town's annual events such as The Big Gig in July, Antiques Street Market in August and Arts Festival in October. Halesworth has a railway station with an hourly service so getting to and from Ipswich and Lowestoft (and further afield) is very straightforward. The town is only 8 miles from Southwold (there is a bus service) and the Suffolk Heritage Coast. The Blyth Valley itself encompasses many attractive villages, nearly all of which all have their own pubs serving great food - often cheek by jowl with a lovely medieval church. Apart from the favourite pastime of walking and church-visiting, activities in the area include cycling (National Cycle Route 1 passes through), angling and horse-riding. 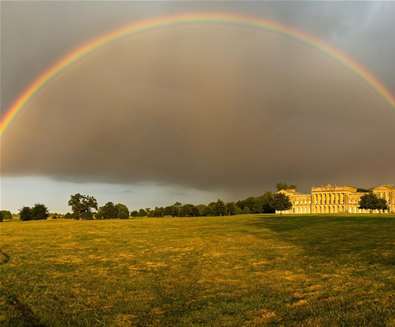 Major annual events in the area include the famous Latitude in, Heveningham, Hall Country Fair with Wings & Wheels in July and Henham Steam Rally in September. The Heart of Suffolk is known for its scenic countryside, medieval villages and famous Suffolk wool towns as well as its two Areas of Outstanding Natural Beauty. The area's artistic heritage is world-class and includes the gentle landscape of Constable Country, where the painter John Constable was born and grew up. He was inspired by his surroundings and created some of his most famous work in the countryside he loved so much and which remains remarkably unchanged today. The bustling market town of Sudbury, where Thomas Gainsborough lived, has a vibrant museum in the house where the artist was born, filled with his work and that of other artists. Sir Alfred Munnings was born in the Heart of Suffolk and his house in Dedham (on the Suffolk/Essex border) is now open to the public, showing many of his equestrian and other paintings. Other attractions include Lavenham, the finest medieval village in Suffolk; the Museum of East Anglian Life, an exciting living history museum; Kentwell Hall, an historic house with medieval re-creations; Helmingham Hall Gardens, a gorgeous Grade I listed garden; The Place for Plants, an aboretum with stunning spring highlights; ancient woodlands; the pretty Shotley Peninsula; navigable rivers for canoeing and sailing; and so much more to appeal to visitors. 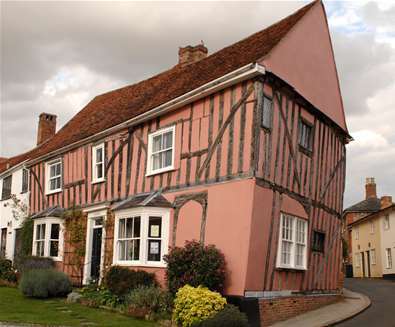 The area also has some fine hotels, B&Bs and self-catering cottages for travellers to rest and relax in the Heart of Suffolk. 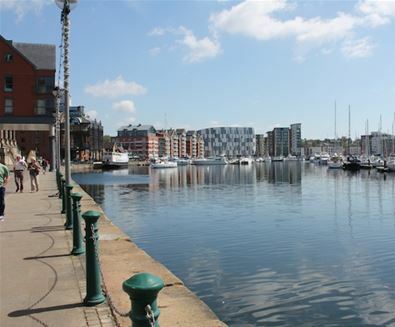 Whether you’re looking for a relaxed day of shopping and exploring or want to plan a trip to the town to coincide with an Ipswich Town game, Ipswich has something to suit all. At the heart of the town lies the Cornhill that has been used a main meeting point for decades. Here you’ll find the bustling market surrounded by shops, coffee shops and restaurants, making it the perfect spot to sit back and plan your time in the town. From here, there’s easy access to the Waterfront via the tranquil and idyllic streets of the Saints that house many of the fabulous independent boutiques. Once on the marina, enjoy a stroll before spending time watching the boats and people go by from one of the terraces of the many bars and restaurants that are found here. As the county town of Suffolk, Ipswich offers a wide range of accommodation options to suit all tastes and budgets. From the four star boutique Salthouse Harbour Hotel on the Waterfront, with its renowned modern art collection, right through privately run and national chain hotels, serviced apartments and holiday lets for those preferring to self cater and well regarded privately run B&Bs and guest houses, there will be something to suit everyone. The Brecks is an area of Breckland in Suffolk and southern Norfolk. Home to Thetford Forest, Go Ape, the Elveden Country Estate and Center Parcs, The Brecks is a popular with walkers, cyclists and adventure sport enthusiasts, plus families looking to escape the hustle and bustle and get up close with nature. Situated on the edge of Thetford Forest, the town of Brandon was once a flint-mining town. Today, visitors can explore the mine; the only one of it's kind still open to the public before heading south to West Stow and the anglo-saxon village. The birthplace of British horseracing, and the location of the historic Newmarket Racecourse, Newmarket holds two of the five British Classic Races, plus countless racing days and the July Festival, the most glamourous event in the racing calendar. You can see mares and their foals at the National Stud, tour the famous Newmarket gallops and racing yards, enjoy the thrill of a day’s racing and cap it all off with dinner in comfortable and relaxed surroundings. When looking for a hotel in Newmarket you’ll find lots of choice. But no matter where you stay, the excitement of life in Newmarket will be unforgettable. The gateway to the Broads National Park,the Waveney Valley sits alongside the River Waveney. Commencing at Oulton Broad the river makes it's way through the countryside and past the towns of Beccles and Bungay. At Oulton Broad, you will find the Edwardian Nicholas Everitt Park; located on the banks of Lake Lothing, children will love the traditional play area, crazy golf and trampolines. Whilst adults can enjoy a pot of tea, cake and ice cream in the cafe whilst watching the boats sail by. The Waveney Valley in Suffolk extends several miles inland, incorporating the towns of Beccles and Bungay. 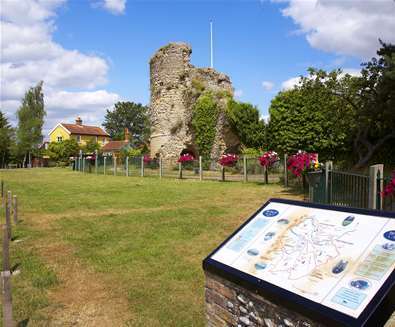 A bustlling market town, Beccles features a host of independent shops, boutiques, cafes and bars whilst the historic town of Bungay boasts antiques and craft shops located around the 15th century castle ruins. We've got lots of information on the Waveney Valley right here!